All kinds of posts are welcome: We have recipes, home remedies, room makeovers, crafts, fashion advice, book reviews, and more! The code for the button is at the end of this post. ~Wendy put her own spin on a Tatertots and Jello favorite with her cheery Rainbow Wreath. ~Oscar Night Cupcakes from Me and My Pink Mixer. They really do look like popcorn! 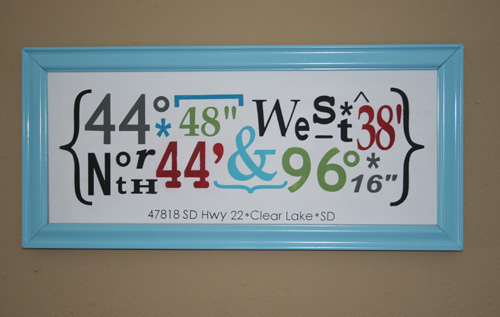 ~JoDee took a plain jane sign and used her "crafty cutter" (Silhouette) to create some Coordinates Typography Art! 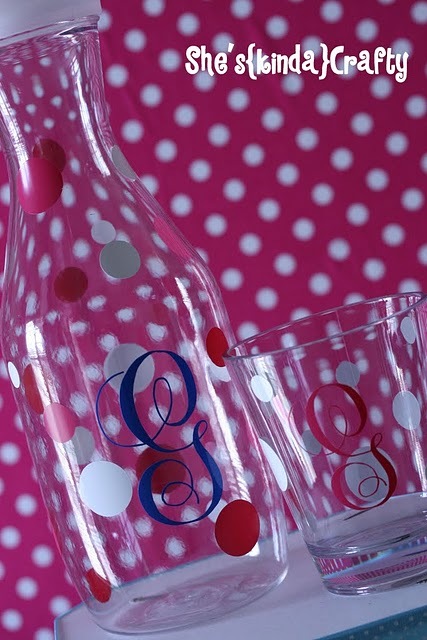 ~Stacy used her Silhouette to create a fun Monogrammed Carafe and Juice Glass Combo. As cute as anything you'll find in Target! 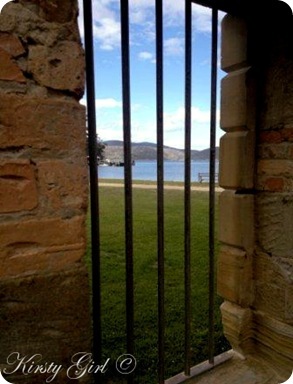 ~If you love traveling, take a trip to Tasmania (an Australian island) with Kirsty. She took readers on a tour of the creepy, yet intriguing Port Arthur Penitentiary. ~Amy transformed her Pantry with her Cricut and some DIY muscle. Stunning! 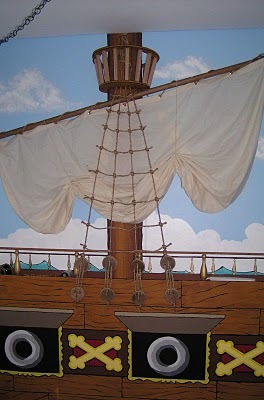 ~Claudia's son gets to live in a Pirate Room! I'm making my way around to each WBR link, and I also hope to have a Silhouette promo for you very soon! Can't believe Saturday rolled around already! Hope you have a great weekend, and cute wreath! That pirate room is pretty nuts. :) Awesome awesome. No links this week since I didn't do a daaaang thing without power, but I'll be party hopping with you on this fun Saturday. thank you so much for featuring my boy's pirate room!!! Thanks so much for featuring me! I love all the Crafty Cutter ideas that were linked up! I'm always looking for a new reason to use my Silhouette!! Thank you for featuring my cupcakes! Thanks also for hosting the link party, I love looking at all the great ideas! Have a great weekend! Thank you so much for featuring my wreath! And thanks for hosting! Thanks so much for featuring my pantry! Have a great weekend! Thank you so much Amanda! I noticed that you specified that Tassie is an Australian island. Do people in America really not know about Tasmania? I have no idea. I've been sent by Happy Homemaker UK. What a wonderful idea for sharing all that your readers have been up to. I'm off to learn more about you. Thanks. Thank you for doing this weekly linky party, and for being so consistent with stopping by and commenting on my blog. I know that you do that with everyone, and your party is growing...so you really are a great hostess to make everyone feel included. So what kind of chocolate did your hubby get you for Valentine's Day? What is your favorite?